When handing us our tickets from Theatre Ancaster’s box office; the lady behind the glass stated “You’ll really enjoy tonight; it’s good enough for any downtown stage!” After sitting through 2 ½ hours of intense vocal and terpsichorean talent; creative direction, and an impacting visual presentation, her observations were certainly not hyperbolic. 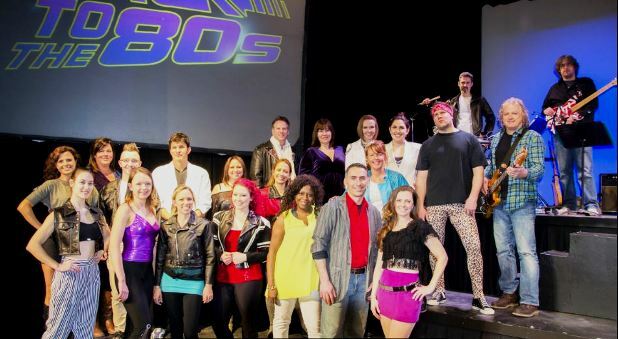 “Back to the 80’s” is a delightful trip; & a reminiscent voyage…not a ‘trip’ in the colloquial of the era! The period was memorable on many levels; the Cold War ended; Iran & Iraq hammered each other; we saw Granada invaded; Tiananmen & Challenger; we witnessed Mt. St. Helens and Chernobyl and listened to Reagan and Gorbachev. Lennon, Sadat, Indira and Palma were all killed; Ronnie and Thatcher were luckier. We bought Commodore 64’s and Mac 128K’s (the ultimate) computers. Folks carried Walkmans™; boom boxes and rented Betamax™. Your humble scribe was young & active enough to compete internationally in yacht races. Today, I couldn’t climb over a bow pulpit to get on board. We all watched ‘Seinfeld’; and laughed at ‘Night Court’. We enjoyed the subtlety of ‘Three’s Company’ & learned ‘The Facts of Life’. Remember the red Ferrari of ‘Magnum P.I.’? Musically, MTV brought us video’s and the most influential performers were Houston and Madonna. Hard Rock and Heavy Metal came into the fore with groups such as Def Leppard; KISS and AC/DC. Many of the above are recalled, tributed and appreciated by the Ancaster production team. Director Jim Broadley has wisely avoided distracting sets in order to concentrate on his cast and their interpretations of the era’s big hits. There is a slight attempt to emulate the look of the original artists but Broadley seems to emphasize the essence or spirit rather than mimicry. Having projected videos of the initial performances lets the audience immediately recall the originators. Costumes, make-up and especially the intricate choreography reflect the style that began the millennial generation. Broadley incorporates the Bee Gee’s insignia ambulatory activities to underscore musical solo riffs. Having the musicians under Colin Lapsley visibly perform stage-rear adds immediacy to each performance. Even the special lighting-effects evoke the period. The singers, whether soloists or ensemble participate in choreographer Angela Broadley’s creations which demand stamina and synchronization; thus double & triple threat performers are de rigeuer. The definitive scene-stealers are the twenty-two munchkins who comprise the Youth Chorus. They simply reek of dedication, enterprise and focus. There is never a misstep or falter, and their contribution to the U2 number or ‘Living Years’ performance is full measure. The adult soloists are about as professional as one gets. Standouts are Stacy Bishop, especially in her ‘Bangles’ interpretation; Adam French, whose ‘Living Years’ with the kiddies is a highlight, only outdone by his Lionel Richie – “All Night Long” number; and Jessica Cano ‘s “Cold Hearted”. The director himself demonstrates vocal ability in Night Ranger’s remarkable ‘Sister Christian”. Almost all positives, however- the ‘Billie Jean’ staging goes on interminably. Madonna’s “Like A Prayer’ closes the show but this scribe went home humming the Act I “All Night Long” offering. It’s also good theatre-goer advice…’Raise the Roof and have some fun’. We did! This would have made a super STAGE WEST offering.